First, in the modern world, language is not the only important communicational system. Today images, symbols, graphs, diagrams, artifacts, and many other visual symbols are particularly significant. Thus, the idea of different types of “visual literacy” would seem to be an important one. For ex¬ample, being able to “read” the images in advertising is one type of visual literacy And, of course, there are different ways to read such images, ways that are more or less aligned with the intentions and interests of the advertisers. Knowing how to read interior designs in homes, modernist art in museums, and videos on MTV are other forms of visual literacy. Furthermore, very often today words and images of various sorts are juxtaposed and integrated in a variety of ways. In newspaper and magazines as well as in textbooks, images take up more and more of the space alongside words. In fact, in many modern high school and college textbooks in the sciences images not only take up more space, they now carry meanings that are independent of the words in the text. If you can’t read these images, you will not be able to recover their meanings from the words in the text as was more usual in the past. In such multimodal texts (texts that mix words and images), the images often communicate different things from the words. And the combination of the two modes communicates things that neither of the modes does separately. 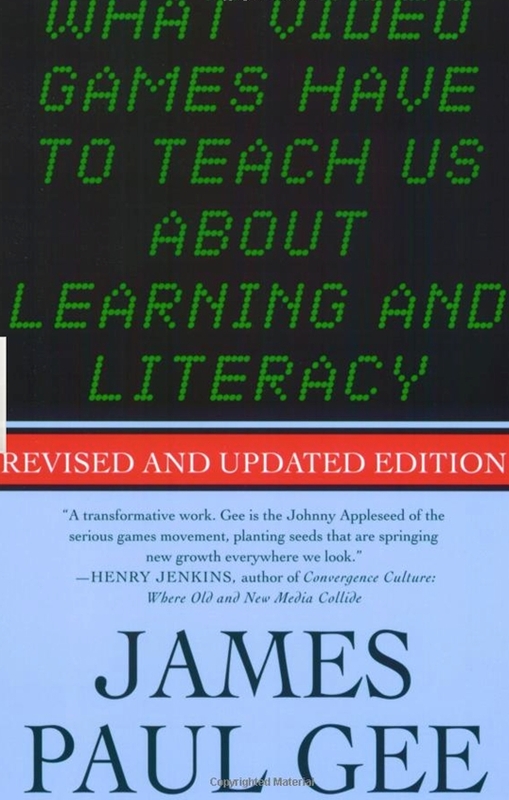 Thus, the idea of different sorts of multimodal literacy seems an important one. Both modes and multimodality go far beyond images and words to include sounds, music, movement, bodily sensations, and smells. Video games are at the very beginning of their potential-”we ain’t seen nothin’ yet.” They will get deeper and richer. Eventually some form of conversation between real people and computer-created characters will occur alongside the conversations among people in their virtual and real identities that already take place in Internet gaming. There are and will be vile games, and eventually there will be some “canonical” games, games that lend them¬selves powerfully to elevating the aspirations and imaginings of all people for better and more just worlds. These may be new aspirations and imaginings or ones that fill old visions with new meanings and hope. But for now, video games are what they are, an immensely entertaining and attractive interactive technology built around identities. I have made but one claim for them here. They operate with-that is, they build into their designs and encourage good principles of learning, principles that are better than those in many of our skill-and-drill, back-to-basics, test-them-until-they-drop schools. It is not surprising that many politicians, policymakers, and their academic fellow travelers who think poor children should be con¬tent with schooling for service jobs don’t like video games. They say they don’t like them because they are violent. But, in reality, video games do violence to these people’s notions of what makes learning powerful and schools good and fair. All aspects of the learning environment (including the ways in which the semiotic domain is designed and presented) are set up to encourage active and critical, not passive, learning. Learning about and coming to appreciate design and design principles is core to the learning experience. Learning about and coming to appreciate interrelations within and across multiple sign systems (images, words, actions, symbols, artifacts, etc.) as a complex system is core to the learning experience. Learning involves mastering, at some level, semiotic domains, and being able to participate, at some level, in the affinity group or groups connected to them. Learning involves active and critical thinking about the relationships of the semiotic domain being learned to other semiotic domains. Learners can take risks in a space where real-world consequences are lowered. Learners participate in an extended engagement (lots of effort and practice) as extensions of their real-world identities in relation to a virtual identity to which they feel some commitment and a virtual world that they find compelling. Learning involves taking on and playing with identities in such a way that the learner has real choices (in developing the virtual identity) and ample opportunity to meditate on the relationship between new identities and old ones. There is a tripartite play of identities as learners relate, and reflect on, their multiple real-world identities, a virtual identity, and a projective identity. The virtual world is constructed in such a way that learners learn not only about the domain but about themselves and their current and potential capacities. For learners of all levels of skill there are intrinsic rewards from the beginning, customized to each learner’s level, effort, and growing mastery and signaling the learner’s ongoing achievements. Learners get lots and lots of practice in a context where the practice is not boring (i.e., in a virtual world that is compelling to learners on their own terms and where the learners experience ongoing success). They spend lots of time on task. The distinction between learner and master is vague, since learners, thanks to the operation of the “regime of competence” principle listed next, must, at higher and higher levels, undo their routinized mastery to adapt to new or changed conditions. There are cycles of new learning, automatization, undoing automatization, and new reorganized automatization. Meaning and knowledge are built up through various modalities (images, texts, symbols, interactions, abstract design, sound, etc. ), not just words. Thinking, problem solving, and knowledge are “stored” in material objects and the environment. This frees learners to engage their minds with other things while combining the results of their own thinking with the knowledge stored in material objects and the environment to achieve yet more powerful effects. Intuitive or tacit knowledge built up in repeated practice and experience, often in association with an affinity group, counts a great deal and is hon¬ored. Not just verbal and conscious knowledge is rewarded. Learning even at its start takes place in a (simplified) subset of the real domain. Learning situations are ordered in the early stages so that earlier cases lead to generalizations that are fruitful for later cases. When learners face more complex cases later, the learning space (the number and type of guesses the learner can make) is constrained by the sorts of fruitful patterns or generalizations the learner has found earlier. The learner sees, especially early on, many more instances of fundamental signs and actions than would be the case in a less controlled sample. Fundamental signs and actions are concentrated in the early stages so that learners get to practice them often and learn them well. Basic skills are not learned in isolation or out of context; rather, what counts as a basic skill is discovered bottom up by engaging in more and more of the game/domain or game/domains like it. Basic skills are genre elements of a given type of game/domain. The learner is given explicit information both on-demand and just-in-time, when the learner needs it or just at the point where the information can best be understood and used in practice. Overt telling is kept to a well-thought-out minimum, allowing ample opportunity for the learner to experiment and make discoveries. Learners are given ample opportunity to practice, and support for, transferring _what they have learned earlier to later problems, including problems that require adapting and transforming that earlier learning. 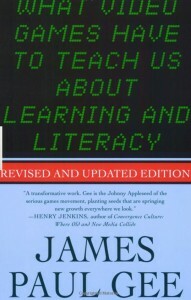 Learning is set up in such a way that learners come to think consciously and reflectively about some of their cultural models regarding the world, without denigration of their identities, abilities, or social affiliations, and juxtapose them to new models that may conflict with or otherwise relate to them in various ways. Learning is set up in such a way that learners come to think consciously and reflectively about their cultural models of learning and themselves as learners, without denigration of their identities, abilities, or social affiliations, and juxtapose them to new models of learning and themselves as learners. Learning is set up in such a way that learners come to think consciously and reflectively about their cultural models about a particular semiotic domain they are learning, without denigration of their identities, abilities, or social affiliations, and juxtapose them to new models about this domain. Meaning/knowledge is distributed across the learner, objects, tools, symbols, technologies, and the environment. Meaning/knowledge is dispersed in the sense that the learner shares it with others outside the domain/game, some of whom the learner may rarely or never see face-to-face. Learners constitute an “affinity group,” that is, a group that is bonded primarily through shared endeavors, goals, and practices and not shared race, gender, nation, ethnicity, or culture. The learner is an “insider,” “teacher,” and “producer” (not just a “consumer”) able to customize the learning experience and domain/game from the beginning and throughout the experience.